"The only fingerprints on the vial were Franco's," Jordan learns. 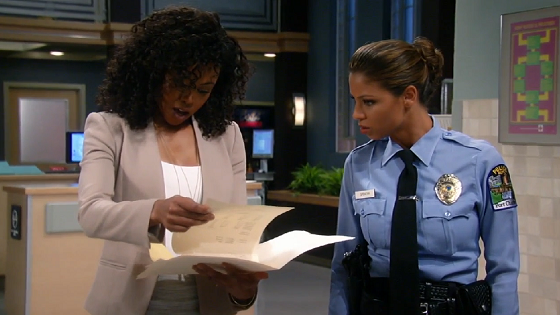 Check out the day-to-day spoilers and a sneak peek video below to find out what's happening on ABC soap opera General Hospital during the week of August 1-5, 2016. Everyone wonders what dangers lie ahead; Jordan asks Andre for help with a case; Curtis has questions for Nina about Franco. Jason returns with news; Elizabeth comes to Franco's defense; Kristina makes a confession to Morgan. "Franco, what do you want with me?" Elizabeth asks. Dillon talks to Valerie about his disappointment; Lucy and Scott have a tipsy reunion; Kiki wonders if Morgan is having a manic episode. A shocking discovery is made; Dillon receives bad news from Darby; Maxie and Nathan reveal news about their nuptials. Jax demands that Carly back down or face consequences; Julian begs Ava for help with his legal troubles. In the sneak peek below, Franco meets Liz for their date. He takes her to a very ominous, dark room...and locks the door behind her.